VILLA PELICANOS is a luxury Sayulita vacation rental getaway, nestled on a stunning lush 2.5 acre lot in Sayulita (private beachfront access and jungle views). The Villa offers a truly magical vacation experience in Sayulita for any group or large family. Relaxing on the property you will feel totally removed from day-to-day hustle and bustle. And, when you want, you can walk to the Sayulita village in 10 minutes for shopping, surfing, ice creams and food. We have WIFI! 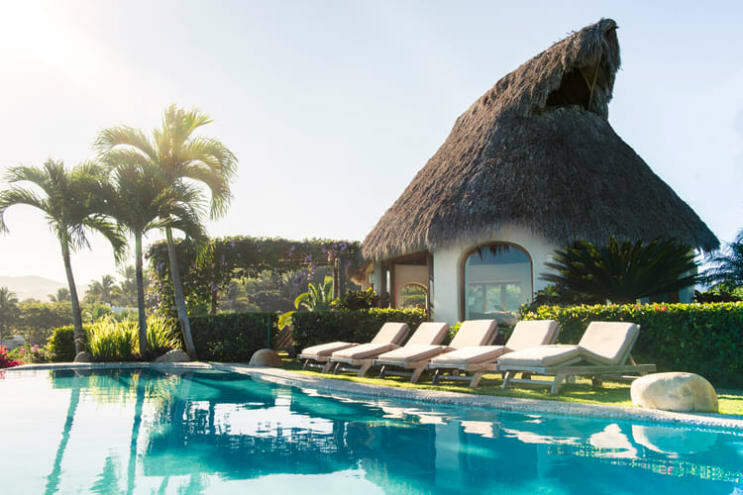 Cool off in the infinity pool while the pelicans fly overhead, build sand castles on the practically private beach or simply sip fresh margaritas while watching the sunset turn into a moon rise at these luxury “safari-lodge type” private casitas in Villa Pelicanos in Sayulita. BEDROOMS: Available for rent are four stylish safari-camp-type casitas with private bathrooms (Casita 1,2,3 & 4), and for an extra charge, there are 3 additional bedrooms (Casita 5, 6 & 7). The Villa comfortably sleeps 14 adults with all 7 bedrooms occupied. If more than 14 people are staying at the property (including kids over 2 years old), additional charges will apply. All the rental casitas are equally beautiful and romantic; they all overlook the ocean and offer a secluded balcony to unwind. The beds all have mosquito netting. The architecture blends harmoniously with the natural habitat; and you will sleep peacefully to the sound of the waves crashing on the beach below. MAIN HOUSE: The main rental house is located on the top of a hill overlooking the ocean and beaches as far as the eye can see. There is a huge living room with a palapa roof, beautifully decorated in a minimalist traditional Mexican style. The fully equipped kitchen is in a separate casita, along with a guest bathroom. And the intimate outdoor dining area is situated with views of both the ocean and the jungle – the perfect setting to entertain your group or family. The infinity pool offers a breath-taking view of Sayulita village, with lounge chairs in the sun and shade. Whales can be seen from the pool area when in season. BEACH: A beautiful private pathway leads past the casitas to a small beach that is not easily accessible to the public. The walk down to the beach winds through lush gardens filled with tropical plants and butterflies. The beach offers a perfect cove for ideal swimming conditions. For our guests there is a private Palapa on the beach for shade, as well as an outdoor shower to rinse off after your swim. SERVICE: A property manager lives on the premises to make your visit as enjoyable as possible. Daily maid service is included for cleaning the house (9am-3pm). A local cook can be provided for an additional charge along with food shopping services, so that you can have breakfast,lunch, cocktails and dinners at your rental when desired. Please note, we do not allow weddings or large events on the property for more than 20 people at a time - no exceptions. I booked Villa Pelicanos with 7 of my girlfriends for a friend's birthday weekend. From the moment we arrived the Villa and Cabanas exceeded our expectations. The property is incredible, lush, and tropical. The infinity pool common area were perfect to hang, eat, and swim. And each cabana had it's own unique style and ocean view. There was so much space we didn't know what to do with all of it. The private beach was also a great addition. And the cobblestone stairs and paths that led through the property were charming and yes- you do have to walk a bit but we thought of it as a way to work off all the margaritas we were drinking. Ha! Juan and the house staff team were on top of all of our needs and requests. We had most meals at the Villa and the food was fantastic. Our rooms and common areas were cleaned every morning and we felt very safe since Javier (the groundskeeper) lives on the property. Everything that Hana set up for us- yoga, massages, transport, was all top quality and the convenience of having everyone come to the villa was perfect for our short trip. I would definitely return to the villa, but next time I would bring more friends! We had a fantastic time at Villa Pelicanos. . a group of 16 (8 couples). The cooks were amazing and grounds were as described. . Perfect location close by but quiet! Very secure and cool layout for this including a semi private beach area. Pictures don’t do this place justice. Host was very helpful and accommodating. Do yourself the favor and get the cooks! They are amazing! Very comfortable for 7 couples. With the 8th We doubled up one of the casitas (they have an extra room attached). . So one couple shared a bathroom but was great format for us! Highly recommended! This was our first visit to the area. . and when we come back we will stay here again for sure! This was our first trip to Sayulita and there is no other place I would have rather stayed than the Villa Pelicanos. The grounds were expansive and large enough to fit five families comfortably. Each family had their own casita and there was ample common area to play and dine. The staff were friendly and the chefs Marianna & Ilda were incredible. They were overly accommodating to our food allergies and vegan families. The location is a short walk or golf cart ride in to town, no more than 10 minutes. I would HIGHLY recommend this property for any large group looking for luxurious accommodations that want privacy yet the ability to be immersed in the Mexican culture. The pictures do not do this place justice!!! Villa Pelicanos is absolutely amazing! We stayed there with five families with young children and loved it. Each family had their own luxury palapa and we were plenty spread out so that we had lots of privacy. The grounds and units are way more beautiful than the pictures even begin to let on. The pool is great for kids and there is even a gate that locks to keep the toddlers from wandering in. We ended up hiring the cook for the entire time and the food was both fabulous and affordable. Her meals were way better and way cheaper than anything we had in town. The property manager was accessible and made arrangements for our transportation from PV and the onsite staff was super friendly and helpful. The villas are a 10 minute walk from town, which is a perfect distance to feel completely separate from the bustling chaos (and loud nightlife) but close enough to head in a couple times a day. The only thing worth mentioning is that the villas are spread out on a steep hill and this place would be hard for elderly people and impossible for somebody in a wheelchair. I personally liked that we had to walk steps multiple times a day because it meant we weren't completely lazy all week, but others might have a hard time with it. If you are even remotely fit, it is well worth it and you absolutely cannot beat this place!!! The absolute best location in all of Sayulita! "Having gotten to know the lay of the land on 2 trips to Sayulita, I can now say with confidence that Villa Pelicanos is the absolute best location in all of Sayulita. It's just removed enough from town to give you the sense of luxurious privacy and quiet at night, yet at easy walking distance. Playa de los Muertos, at the base of the property, is a beautiful, uncrowded beach that's perfect for swimming and a welcome escape from the crowds and vendors on the main beach. The accommodations are comfortable and tasteful, and it can hold a large group while still giving everyone their sense of privacy. The buildings have a beautiful sense of design, from the local tile work that runs throughout the buildings, to the vibrant colors in the paint trims and fabrics, and the masterful brickwork in the vaulted kitchen ceiling. Every window looks out on a post-card perfect view. The indoor-outdoor feel of the rooms is just the way you want to be living when the weather is so lovely day and night. Villa Pelicanos provides the best of hotel service and the comfort of home. With Javier and Mariana on the property, we felt safe and knew we could have our questions answered, and would have help in case of any emergencies. They are warm and friendly, eager to help and even teach us to mix the best margaritas! We loved having the chef services for some of our meals, while being able to prepare our own meals or go to restaurants in town at other times. The maid service was excellent, and the property is maintained with careful attention to details. Hana and Juan were very helpful in making the preparations for our arrival, and checking in on us during our stay. They take pride in this home as though it is theirs, and want their guests to have the very best experience. For our family gathering of 14 people, we felt we had found heaven on earth. " Spectacular spot to spend a special vacation! We celebrated my 40th here with 10 friends and it was absolutely perfect. From the wonderful staff to the beautiful casitas in which everyone has an equally private, romantic experience, to the stunning private beach, to the incredible views, every moment at Villa Pelicanos was blessed with a magical quality. we could venture into town or escape back to our luxury oasis... the chefs and staff were very sweet and accommodating. I highly recommend this place, worth every penny! Truly the most special place imaginable, complete with stunning hospitality! This was truly or first vacation were we left and actually felt we had a vacation. Absolutely beautiful! Words cannot do justice to this place! HIGH SEASON: 16th October to May 31st. Reservations for entire week receive 7th night free of charge. All prices are in US dollars. Breakfast and lunch chef services are included; Food costs, not included. Tax included in rate. 50% now to confirm reservation, other 50% payable the week before arrival via wire transfer. Tips for staff are appreciated.